Following to the invitation from Ellen Blumenstein, an intependet curator from Germany, a member of the curatorial collective The Office and the curator of the Pavilion of Iceland at the 54th Venice Biennale, Kim? 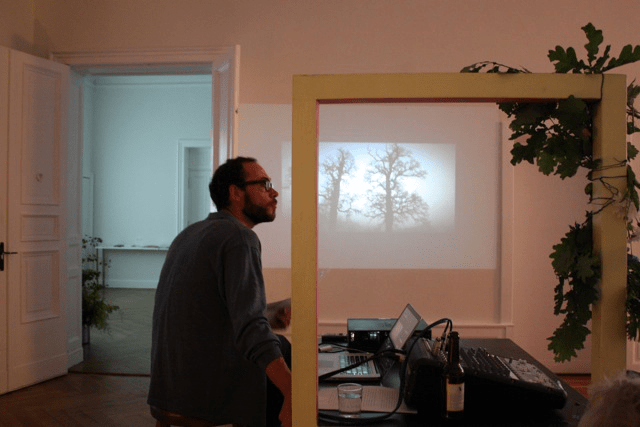 together with a culture theoretician Kaspars Vanags and an artist and a curator from Lithuania Juste Kostikovaite presented a lecture at Salon Populaire, in Berlin, right before the midsummer eve. The theme of this event is Bucolic Genre Today: Somewhere Between a Subtrend of Organic Lifestyle and Provincial Art. In the lecture tendencies of the bucolic gendre in the art of the Baltics and equivalent peripheral regions in Europe will be observed. The speach and discussions will be complemented with presentations of works by such artists from the Baltics like Andris Eglītis, Arne Maasik, Egidijus Praspaliauskas & Rasa Juškevičiūtė, Ieva Epnere, Ilze Vanaga, Inta Ruka, Jonas Lozoraitis, Krišs Salmanis, Žilvinas Landzbergas and others. The event took place on June 22 at 8pm at Salon Populaire, Bülowstr. 90/10783, Berlin. We thank for support to airBaltic, the Latvian Museum of Photography and Anda Boluža.